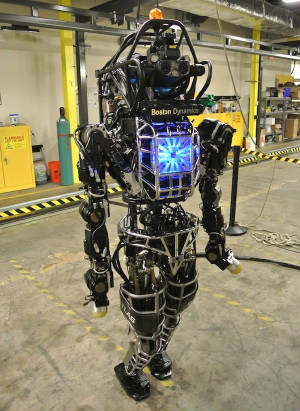 Said to be for search and rescue, or is this really a battle droid for search and destroy? American Dream Website posts -- 10 Ways That The Iron Grip Of The Big Brother Prison Grid Is Tightening On All Of Our Lives. 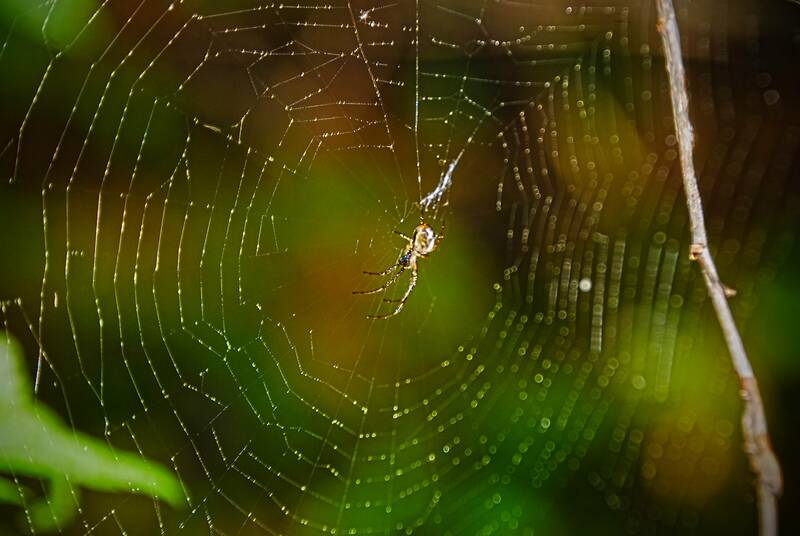 "Do you ever feel trapped in an invisible control grid that is slowly but surely closing in all around you? Do you ever feel like virtually everything that you do is being watched, tracked, monitored and recorded? If so, unfortunately it is not just your imagination. Our society is rapidly being transformed into a Big Brother prison grid by a government that is seemingly obsessed with knowing everything that we do. They want a record of all of our phone calls, all of our Internet activity and all of our financial transactions. They even want our DNA. They put chips in our passports, they are starting to scan the eyes of our children in our schools, and they have declared our border areas to be “Constitution-free zones” where they can do just about anything to us that they want. The Bill of Rights has already been eroded so badly that many would argue that it is already dead. The assault against our most basic freedoms and liberties never seems to end. The following are 10 ways that the iron grip of the Big Brother prison grid is tightening on all of our lives…"
Visit the American Dream website for full details on these 10 ways. We news junkies are already aware of most of this, but many folks are unawares, or are in denial. The Bible passage below speaks of "the mystery of iniquity." I believe the "mystery of iniquity" is very much what we are seeing in this amassing of evil against us. The passage also speaks of the "that man of sin be revealed, the son of perdition." This person is generally called the Antichrist. Note also the tremendous deception God will send on those who reject his love, in the person of the Savior, Jesus Christ. 7 For the mystery of iniquity doth already work: only he who now letteth (is blocking) will let, until he be taken out of the way. 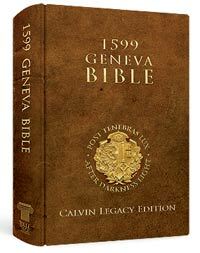 The Geneva Bible uses "the departing" in place of "a falling away first," in verse 3, King James Bible. 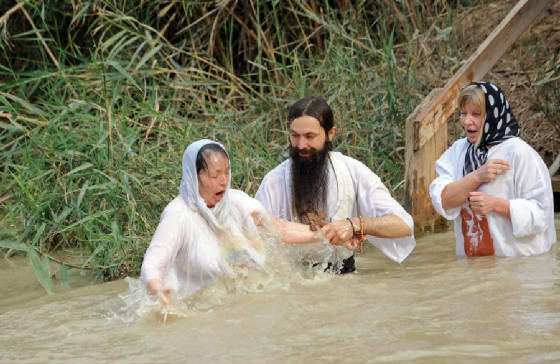 I believe, all things considered, that it is the presence of the Christian Church, with its indwelling Holy Spirit that is blocking the appearance of the man of sin. Thus, the rapture must take place, removing the Church, before the man of sin can appear. We should all be praying "Lord Jesus come quickly," (Rapture us) as we see these evils building against. God can use a word in several of its meanings simultaneously. In the case of verse 3, the departure of the Church, and a general departure from the true faith, which we see happening all around us now. The Mystery of Iniquity is certainly multifacited. The forces of evil are surely playing many angles. Wikipedia's Boiling Frog article on that metaphorical idea of many small, unnoticed, incremental changes, adding cumulatively until the startled, rudely awaking people are left with no way out of the disaster. 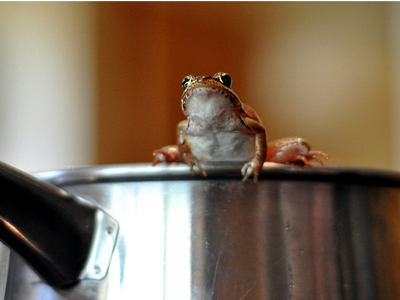 "The boiling frog story is a widespread anecdote describing a frog slowly being boiled alive. 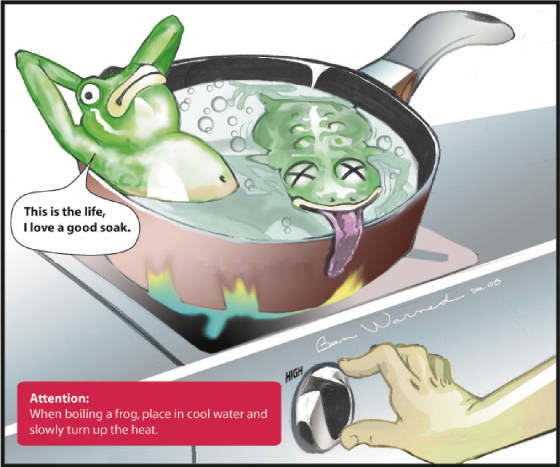 The premise is that if a frog is placed in boiling water, it will jump out, but if it is placed in cold water that is slowly heated, it will not perceive the danger and will be cooked to death. The story is often used as a metaphor for the inability or unwillingness of people to react to significant changes that occur gradually. According to contemporary biologists the premise of the story is not literally true; a frog submerged and gradually heated will jump out. 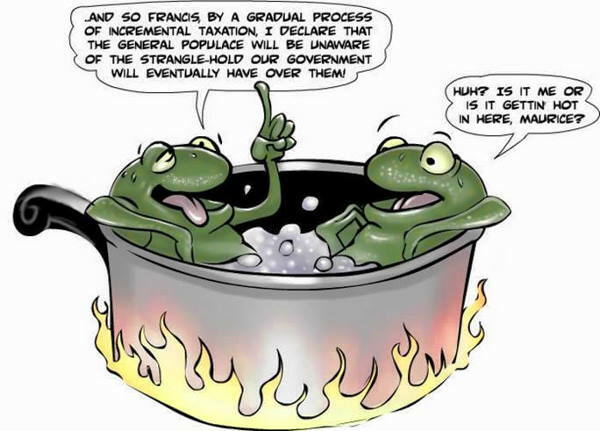 The boiling frog story is generally told in a metaphorical context, with the upshot being that people should make themselves aware of gradual change lest they suffer eventual undesirable consequences. This may be in support of a slippery slope argument. It is also used in business to illustrate the idea that change needs to be gradual to be accepted. The expression "boiling frog syndrome" is sometimes used as shorthand for the metaphor. The story has been retold many times and used to illustrate many different points. It has been used to warn about diverse phenomena, for example: in 1960 about sympathy towards the Soviet Union during the Cold War; in 1980 about the impending collapse of civilization anticipated by survivalists; in the 1990s about inaction in response to climate change and staying in abusive relationships. It has also been used by libertarians to warn about slow erosion of civil rights. In the 1996 novel The Story of B, environmentalist author Daniel Quinn spends a chapter on the metaphor of the boiling frog, using it to describe human history, population growth and food surplus. Pierce Brosnan's character Harry Dalton mentioned it in the 1997 disaster movie Dante's Peak in reference to the accumulating warning signs of the volcano's reawakening. Al Gore used a version of the story in his presentations and the 2006 movie An Inconvenient Truth to describe ignorance about global warming. In his version the frog is rescued before it is harmed. In philosophy the boiling frog story has been used as a way of explaining the sorites paradox. This paradox describes a hypothetical heap of sand from which individual grains are removed one at a time, and asks if there is a specific point when it can no longer be defined as a heap." "Several experiments involving recording the reaction of frogs to slowly heated water took place in the 19th century. In 1869, while doing experiments searching for the location of the soul, German physiologist Friedrich Goltz demonstrated that a frog that has had its brain removed will remain in slowly heated water, but his intact frogs attempted to escape the water. Goltz raised the temperature of the water from 17.5 °C to 56 °C in about ten minutes, or 3.8 °C per minute, in his experiment which prompted normal frogs to attempt to escape, whereas Heinzmann heated the frogs over the course of 90 minutes from about 21 °C to 37.5 °C, a rate of less than 0.2 °C per minute. One source from 1897 says, "in one experiment the temperature was raised at a rate of 0.002°C per second, and the frog was found dead at the end of 2½ hours without having moved." In 1888 William Thompson Sedgwick explained the apparent contradiction between the results of these experiments as a consequence of different heating rates used in the experiments: "The truth appears to be that if the heating be sufficiently gradual, no reflex movements will be produced even in the normal frog; if it be more rapid, yet take place at such a rate as to be fairly called 'gradual', it will not secure the repose of the normal frog under any circumstances". Modern sources tend to dispute that the phenomenon is real. In 1995, Professor Douglas Melton, of the Harvard University Biology department, said, "If you put a frog in boiling water, it won't jump out. It will die. If you put it in cold water, it will jump before it gets hot—they don't sit still for you." Dr. George R. Zug, curator of reptiles and amphibians at the National Museum of Natural History, also rejected the suggestion, saying that "If a frog had a means of getting out, it certainly would get out." In 2002 Dr. Victor H. Hutchison, Professor Emeritus of Zoology at the University of Oklahoma, with a research interest in thermal relations of amphibians, said that "The legend is entirely incorrect!". He described how the critical thermal maximum for many frog species has been determined by contemporary research experiments: as the water is heated by about 2 °F, or 1.1 °C, per minute, the frog becomes increasingly active as it tries to escape, and eventually jumps out if the container allows it."